Sometimes people respond to “thank you” the same way: “you´re welcome”, “any time”, “don´t mention it”. 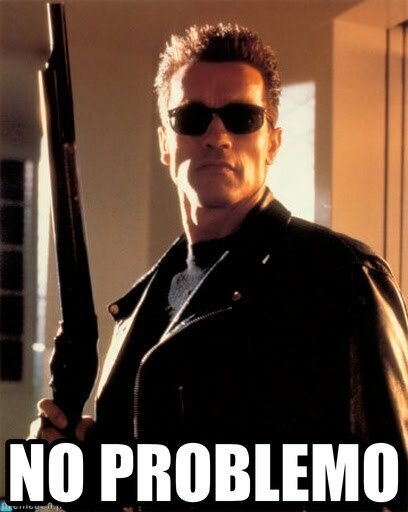 However, whenever I hear a native English speaker saying “no problem” I can´t help remembering the famous answer of Schwarzenegger “no problemo“. “In common conversation in the US Midwest I rarely hear “Not at all” or “Don’t mention it.” “No problem” is very common, and “You’re welcome” is also pretty well-used. My personal usage: I use “Not at all,” “Don’t mention it,” and “No problem” when the activity I’m being thanked for was really no big deal. I use “My pleasure” when emphasizing that I’m happy to be of assistance (often in a customer service context), and “You’re welcome” when the action prompting the thanks was a little bit of a bother. In essence I use different phrases to indicate how “thanks-worthy” the activity was. That’s probably not common usage, though. I think I misrepresented what I originally meant, so here’s a little clarification.